Classic movies, book discussions, lunches, outings, and more. The Adventurous Adventonians is a group for fellowship, discussion, and fun. They often meet for "Lunch-and-a-Movie" gatherings after 11am worship in the basement fellowship hall, but also sponsor a wide variety of events at Advent, and go on outings throughout the city. Interested in joining the Adventurous Adventonians for their next movie or outing? Click below to learn more and get connected. 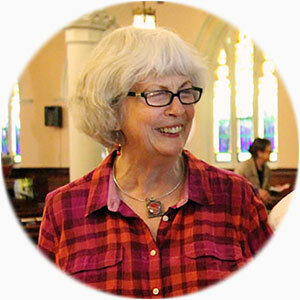 Kathy C. has been an active member of Advent for many years, serving in all kinds of leadership roles. She's passionate about maternal health and child nutrition, an area she worked in for many years. Kathy loves old movies, good books, conversation, and a good laugh. Kathy M. has been an Advent members for many years, and participates in a variety of ministries and groups.